I first met Khoi at the Menfluential conference a few years ago, and he's a friend I always look forward to catching up with each year. He's thoughtful and easy-going, and incredibly driven. Since going to Menfluential the first time, he's started Gentleman Within, an awesome site where he shares his style journey and inspires and helps others to start their own. 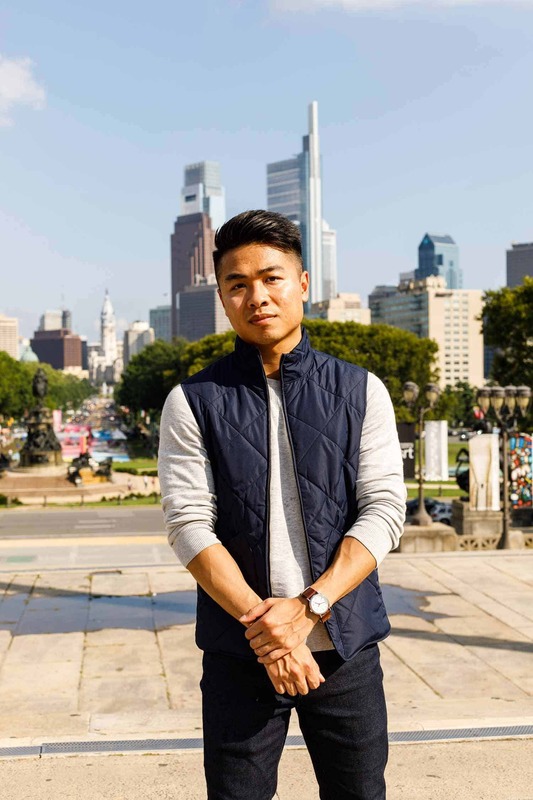 I'm excited to feature Khoi as this month's Reader Getup, I love how this outfit brilliantly balances the end of summer and the beginning of fall. Khoi has put together some helpful insight and his photos are killer. I love the simplicity of summer style. It encourages minimalism by saying more with less. On the other hand, fall style has more intricacies that makes dressing stylishly, fun and equally challenging. With a myriad of different boot styles to try on, accessories to experiment with, all the while keeping in mind fit and silhouette, it’s no wonder nailing fall style can be a challenge. The look in this Live Action Getup is somewhat of a transitional uniform for me. 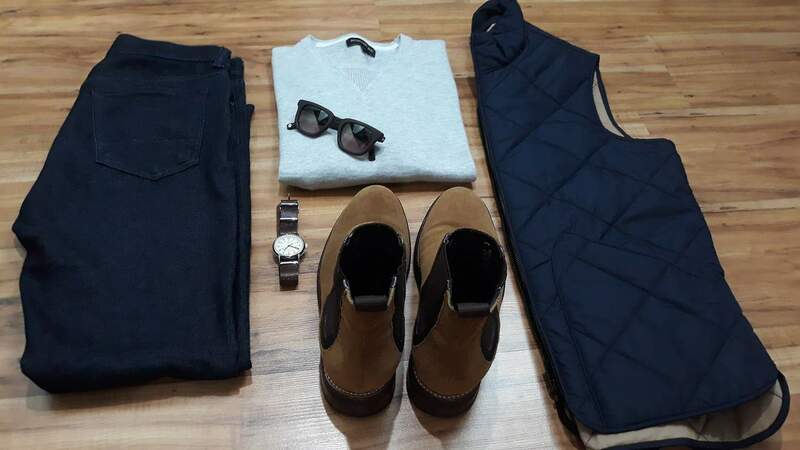 It’s the perfect balance of smart and casual, rugged and refined. 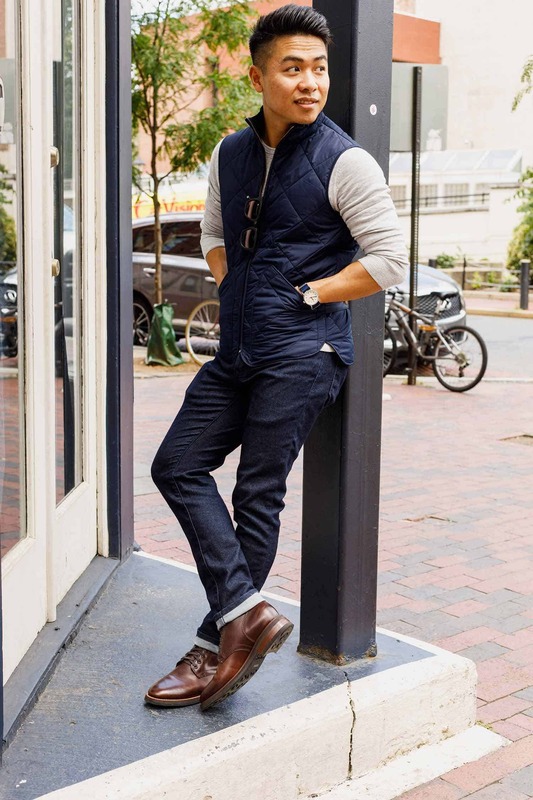 Let’s start with the light-padded vest, one of my favorite layering pieces. 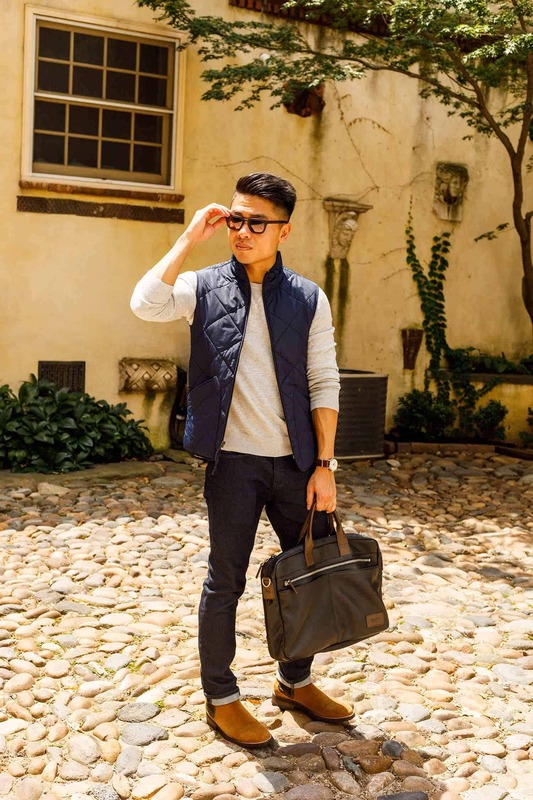 It’s a simple, stylish way to transition your style from summer to fall. I went with the blue vest because IMO, navy and brown are an excellent color pairing. Besides being one of my favorite color schemes, both of these colors are versatile and play well with all different shades of colors from gray to olive to beige, and even black. The lightweight nature of the vest gives it a refined appearance. If it were thicker and baggier, it would give off a more rugged vibe. It not only looks great, but can be worn overtop of a t-shirt, henley, sweatshirt, OCBD or layered underneath a denim jacket. 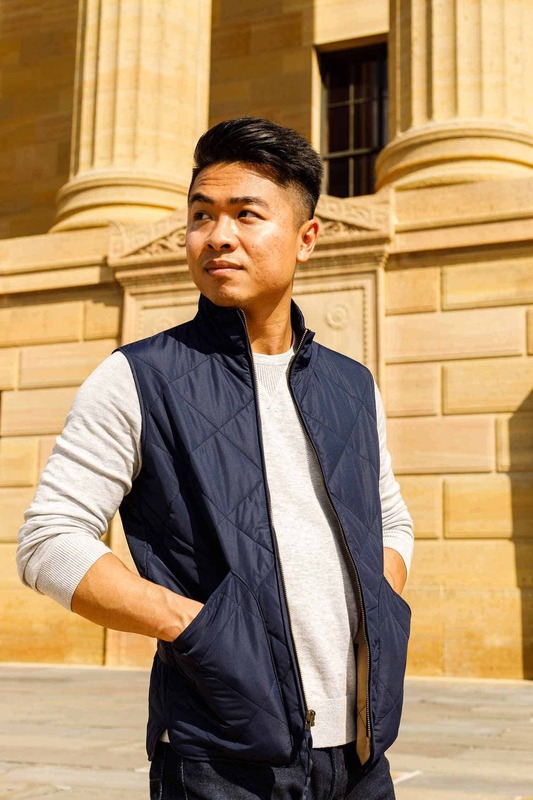 It’s this versatility that has made this quilted Walker vest from J.Crew Factory a staple in my summer/fall transitional wardrobe. Now let’s move on to the athletic-inspired light gray sweatshirt. This classic menswear piece looks great both fitted or slightly roomier. I went with a snug fit throughout the body and arms which makes for a cleaner silhouette. I rolled up the sleeves to give the look a casual cool nonchalance. Working our way down, let’s talk about dark wash denim. What about dark wash denim? 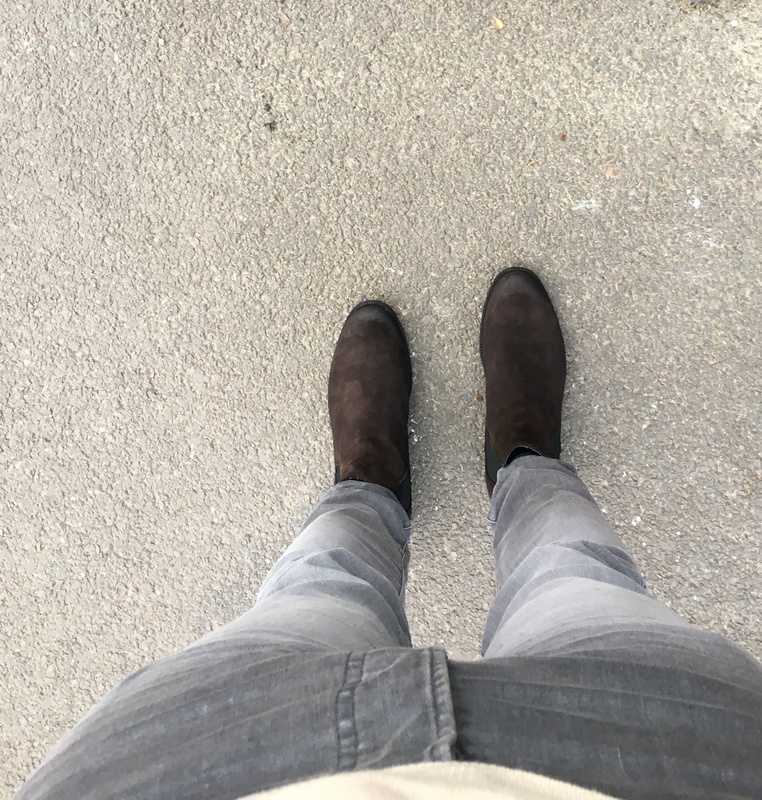 Well, I’ve written an entire article on why dark wash jeans are essential to a man’s wardrobe. 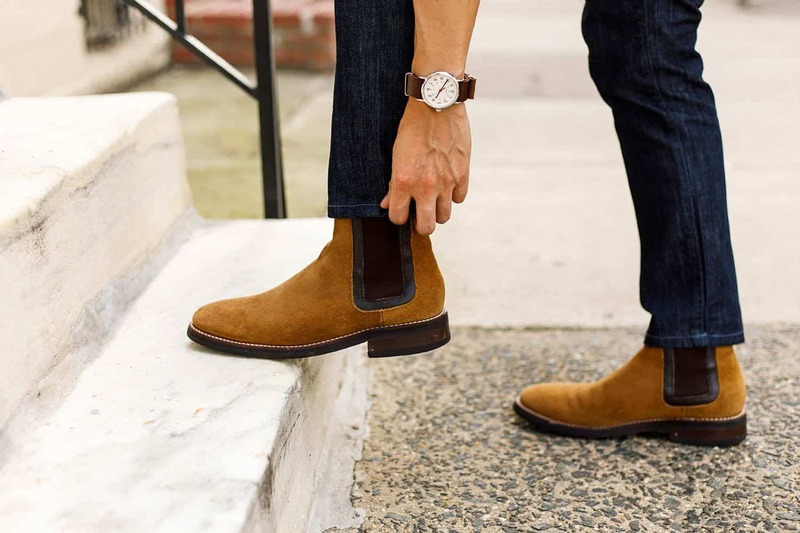 A fall Getup isn’t complete without a quintessential plain-toe or chelsea boot. For this Getup I think both of them work. The boots add a dash of ruggedness to the look while balancing with refined qualities. These boots from Thursday have a slimmer profile and silhouette than a chunkier Wolverine or Thorogood, which would make this look sway into rugged territory. These Thursday boots give a good balance between rugged and refined as I mentioned before. Finally, we can’t leave without mentioning the accessories. Sunglasses are an essential year-round and for this look I went with a matte brown pair with green gradient lenses. Gotta protect your eyes from squinting and prevent those crows feet. Can’t forget a quality leather messenger bag that’s equal parts functional and stylish. 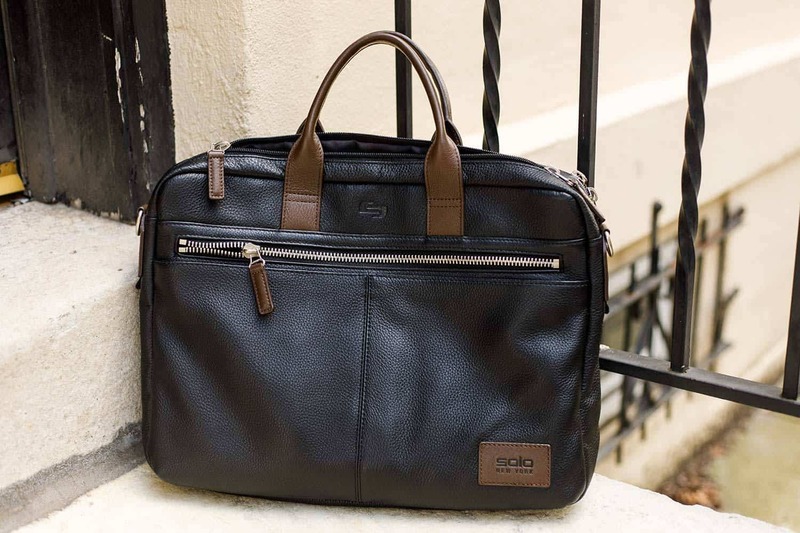 Solo NYC makes some great bags that has all the carrying space you need while maintaining a relatively slim profile. I love how the brown accents pop off of the black, pebble grain leather. 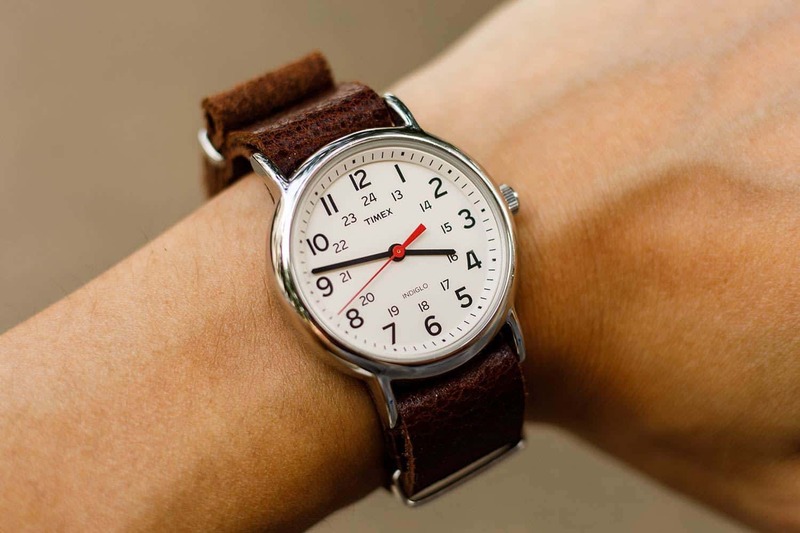 Lastly, for a quick wrist check, I’m rocking the classic, clean-faced, Timex Weekender with a custom brown leather strap which again makes the overall look a touch more rugged. I want to thank Andrew for allowing me the opportunity to share this look with the Primer Magazine community. 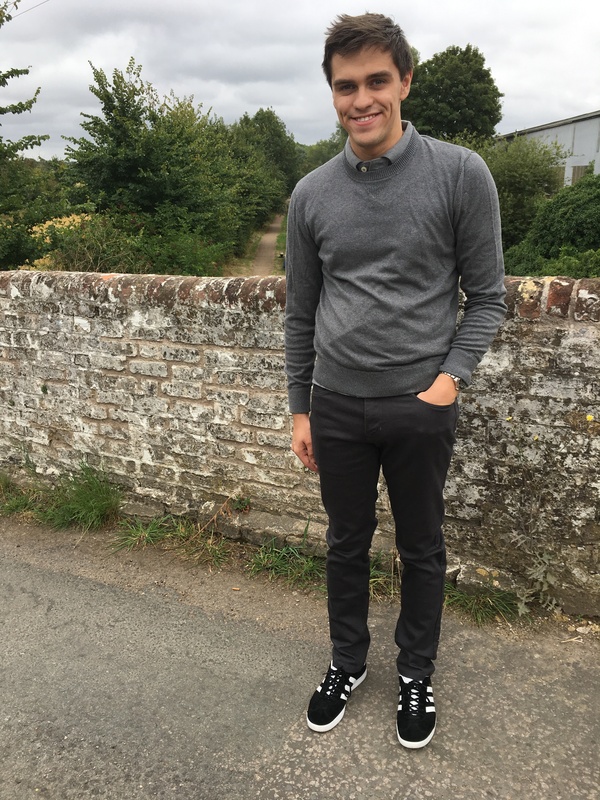 I’ve been an avid reader of Primer and the LAG series for a long time and so it’s an honor to be able to contribute to Primer and its wonderful community of stylish gents.I hope this article shows you how easy the summer to fall transition can be simply by introducing a few key elements of fall style into your daily Getups. Khoi Nguyen is the Founding Editor of www.gentlemanwithin.com. He created Gentleman Within to help men dress better, feel amazing, and live their best life. He believes that style is worth caring about, and that through style, men can achieve greatness. If you liked this article, visit his site and check out the ‘I Am A Gentleman’ Manifesto a credo and call-to-action for us as men—to live our lives the best way we know how; courageously and with purpose. What’s Your Getup, And What Inspired You? I want to say a huge thanks to Khoi for sharing his Getup and inspiration with us, and encourage you to get in touch and share your own. Email us, tag @primermagazine on Instagram, @primerag on Twitter, or upload a photo into any Primer article comment! Be sure to check out Zac's and Devon's Reader Getups too. Clean. This is my kind of getup. Great to see Khoi here on Primer! Brock, perfect explanation for it. Clean! I agree this is my style of getup as well! Was awesome to contribute! Primer’s been a huge inspiration for me. Great to see more well heeled, pun intended gents on here committed to men’s style and shaping men’s style. I’ll have to look into your blog as your style is similar to mine, minimal, clean and put together. Wish I had more access to Banana Republic in the U.K. I’d like to try their traveler jeans. What do you think of them? Thanks Zac, I love my BR traveler jeans. Probably my favorite pair of dark wash denim. Excellent stretch, durability and fit. Bonus is that it comes in a 28″ inseam. Been looking at this and the black color of vest from JCrew. How tall is Khoi? And how do you feel it fits in the torso length? I’m 5’9”-5’10” but want to make sure it covers the length of my mid section. Hey Ross, I’m 5’6″ and got the x-small. Fits me perfect. I’m thinking a M or L would fit for you in the length, though not entirely sure. Love the fitted, clean looks and the suede chelsea’s nappy texture. Are they H&M’s premium line? They are. I got them on sale a year or so ago. They’ve held up really well. Not bad for how affordable they are. Is there a the link to the sunglasses? 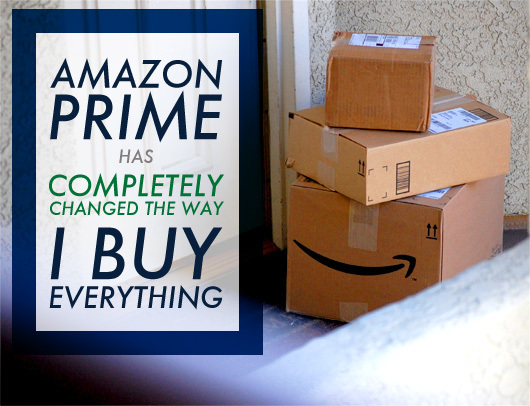 Unfortunately not since that particular model is sold out and they haven’t restocked. Is the leather band compatible with the standard weekender watch? The strap the standard watch comes with has 2 metal loops but it looks like the leather one has 3. Does the 3rd one fit through the watch head? Yes, it’s compatible with the standard weekender. It’s a nato so the metal loops stay where they are and don’t need to fit through the watch head.